Taut free verse tells the little-known story of the first contraband camp of the Civil War—seen by some historians as the "beginning of the end of slavery in America." One night in 1861, three escaped slaves made their way from the Confederate line to a Union-held fort. The runaways were declared "contraband of war" and granted protection. As word spread, thousands of runaway slaves poured into the fort, seeking their freedom. These "contrabands" made a home for themselves, building the first African American community in the country. In 1863, they bore witness to one of the first readings of the Emancipation Proclamation in the South—beneath the sheltering branches of the tree now known as Emancipation Oak. Susan VanHecke is the author of Raggin’ Jazzin’ Rockin’: A History of American Musical Instrument Makers (Boyds Mills, 2011), an ALA Notable Children’s Book; and An Apple Pie for Dinner (Marshall Cavendish, 2009), as well as several books for adults. She lives in Norfolk, Virginia. In 1861, three slaves escape from Confederate Virginia and find freedom. When their owner demands their return under the Fugitive Slave Act, Union Gen. Frank Butler declares that since Virginia has just seceded, the men are "contraband of war." Many other escaped slaves join them and build a community called Slabtown. A year into the war, another town called Grand Contraband Camp arises from the ruins of Hampton, Va. While former "chattel" spend their days working for the Union Army, their evenings are devoted to learning letters and numbers from missionary teachers standing under a live oak. The year 1863 brings the Emancipation Proclamation, read aloud under what the community calls the Freedom Tree. A precedent was set as, according to the author's note, the land grew into Hampton University. The Emancipation Oak, that Freedom Tree, is now part of a National Historic Landmark District. VanHecke's free-verse narrative is compelling, informative and emotive, telling the story by year from 1861 to 1863. Ladd uses acrylic and pastel paints with colored pencils to present a realistic depiction of events, the danger that the men faced while escaping and the jubilation felt as they listened to the words that freed them. A valuable addition to the expanding canon of books on slaves escaping to freedom. In 1861, when Union General Benjamin Butler refused to return three escaped slaves to their owners, calling them "contraband of war," he set off a little-known episode in history in which more than nine hundred slaves ended up in Hampton, Virginia, working for the Union army. They were one step closer to freedom, though they were far from free. Eventually, schools were set up in Slabtown and Grand Contraband Camp, and these early schools led to the founding of Hampton University. Told in a spare, poetic voice, this story is filled with bravery, luck, and timing. If the initial three men had escaped any earlier, the Union officer would have been bound by the Fugitive Slave Act, but with the secession of Virginia, he argued that the law no longer applied. Realistic acrylic paintings depict the everyday life of the "enemy property," as the growing community builds a new town near the old oak tree that serves as shade for the school and place of joy to celebrate the Emancipation Proclamation. The lengthy author's note fills in the details left out by the brief verse, making this one a story to read more than once. 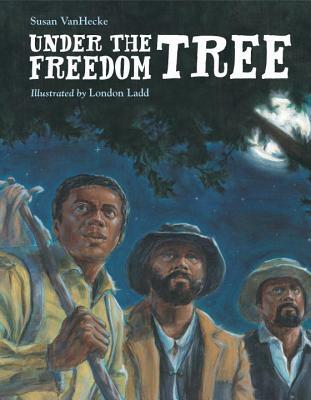 Slavery is a challenging topic to introduce to young readers, but they have to start somewhere. This, along with Shane Evans's Underground (rev. 1/11), is a terrific place to begin. A vivid free-verse account of a little-known event during the Civil War. On a night in 1861, three slaves escape from a Confederate Army camp and slip across the water to a Union-held fort. Rather than send them back to their owners, the general declares them "contraband of war" and allows them to stay. This decision brings a flood of other escaped slaves hoping for something better. A makeshift town is created, and gradually the "contrabands" now have a space of their own. The story concludes with the announcement of Lincoln’s Emancipation Proclamation and the rejoicing of slaves beneath the Freedom Tree. The concise verse brings a piece of history to life and begs to be read aloud, evoking the names and desperation of those long-ago escapees, while Ladd’s full spreads complement the text and give faces to the figures. This simple but unforgettable title would be useful for fleshing out Civil War studies and prompting further discussion of slavery and emancipation. Additional background information is included in the author’s note, and the bibliography provides interested readers with more resources and documents. This powerful picture book would likely appeal to readers of Charles R. Smith Jr.’s Brick by Brick (HarperCollins, 2012). In staccato verse, VanHecke (Raggin’ Jazzin’ Rockin’) illuminates an absorbing slice of Civil War history: runaway slaves’ establishment of a settlement in newly seceded Virginia. In 1861, three slaves—Frank Baker, James Townsend, and Shepard Mallory—escape by boat from a Confederate camp, “Away/ from Southern soldiers/ who would/ own them,/ work them,/ beat them,/ sell them,/ keep them slaves forever.” The three men land at a Union camp whose commander declares them “contraband of war” and refuses to return them to the Confederates. They and hundreds of other runaways who subsequently arrive in “Slabtown” work for the Union army and build two camps. Missionaries educate the children under the branches of the tree now known as the Emancipation Oak, where, in the story’s triumphant finish, a boy reads the Emancipation Proclamation. Ladd’s (Oprah: The Little Speaker) evocative and subtly textured acrylic, pastel, and colored pencil art reflects the evolving tenor of the story as uncertainty gives way to hope. An extensive author’s note delves deeper into this immersive true story of courage and grit.